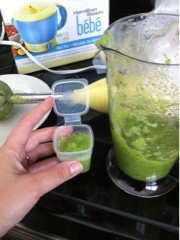 Today I made zucchini purée for the next new veggie for baby to try. 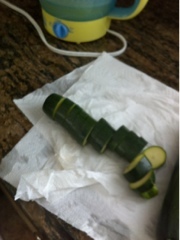 I washed 2 zucchinis and chopped the ends off and sliced it. Then steamed it for about 10 minutes. Let it cool. And blended it all up. 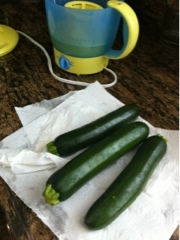 2 small zucchinis made 6 40ml cubes. I then placed them in the freezer. 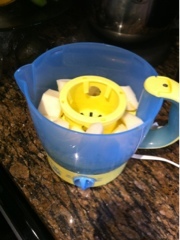 Today I also made more pear purée to freeze. 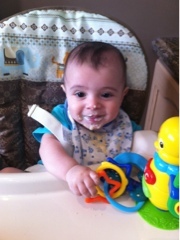 Baby has been loving his Oat cereal more than the rice cereal. So we have Oat cereal now 3x a day with 2 40ml cubes of fruits/veggies. Baby K is 7 months!! Tomorrow I'll write a post about that! This week we tried pears! 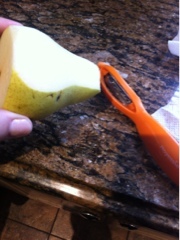 I used 2 pears, peeled cut out the seeds, chopped them up and steamed them for about 8 minutes. 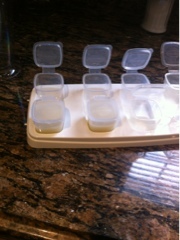 I then blended them into a purée. I did not add any water since the pears are pretty juicy themselves. Monday I made pear and butternut squash purée for the whole week. I placed 2 days of the cubes in the fridge and the rest in the freezer. I've been giving baby boy pears at lunch and butternut at dinner. However yesterday I mixed pears and squash together for both meals. Next week we will be on to apples and sweet potato.